At Trinity College Dublin we have a proud tradition of converting concepts into impact in performing world class research and translating this research excellence into solutions with global economic and social results. This is achieved by fostering a culture of innovation and entrepreneurship across all disciplines, for both staff and students. In the last four years the results have included 112 licence agreements for technology transfer, over 450 collaborative agreements with Industry and 17 spinout campus companies. In June of this year, the Research and Innovation unit at Trinity College Dublin (TR&I) collaborated for the first time with the team from the Development and Alumni (TDA) in curating an event to bring alumni and leading Trinity researchers and entrepreneurs to showcase current work, discuss future trends and explore opportunities for engagement and collaboration. 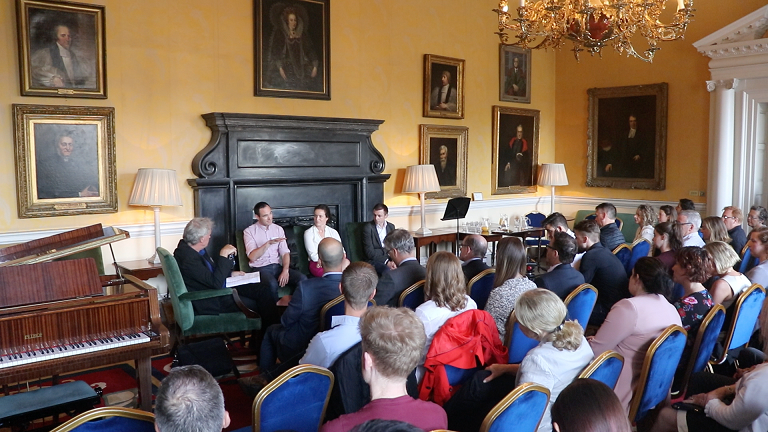 The event was held in the historic senior common room on the Front Square where a number of our most recent campus company founders were interviewed by Professor Luke O Neil, himself a successful entrepreneur. The focus of this inaugural event was Life Sciences and the those on panel that evening included Dr Conor Harkin of Proverum, an early stage medical device company developing an innovative medical device technology to treat prostate gland issues, Dr Lucy O Keeffe of CroiValve, an early stage medical device company focused on developing a minimally invasive device for the treatment of a heart condition and Dr Matthew Campbell, Principal Investigator and Entrepreneur at the Smurfit Institute of Genetics. TR&I and TDA took to London for their next collaboration and to the recently opened Science Gallery at Kings College on Oct 23rd last. 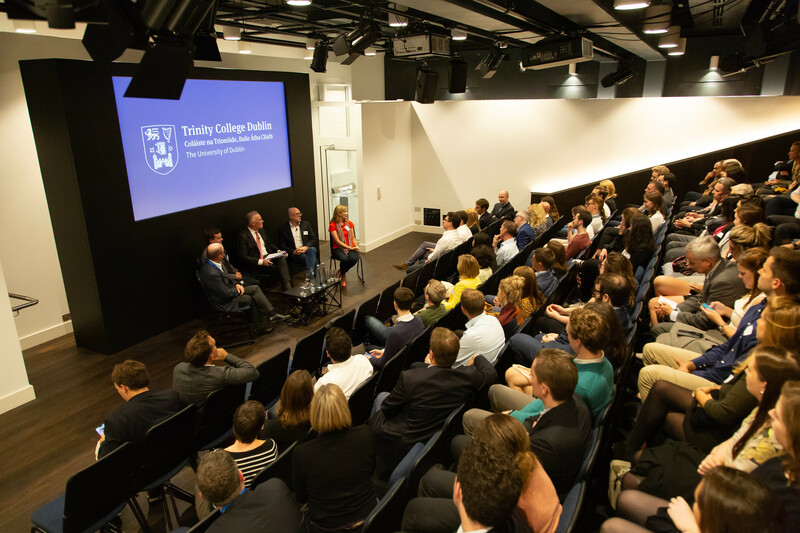 The focus for this event was ICT and panel discussion was chaired on this occasion by Professor Gerard McHugh, Dean of Development at Trinity and former Head of the Trinity Business School. The panel included David McDonald of Danalto which offers full application end to end solutions for next generation Low Power Wide Area IoT ( Internet of Things ) and value enhancing services to Enterprises and the Public Sector. Also on the panel was Kevin Feeney of Data Chemist which was makes big data meaningful by building structured, consistent data stores that support decision making and business intelligence. Helen McBreen of Atlantic Bridge was also on the panel and she shared the work of her organisation in enabling these new campus companies by providing early investments via the €60m University Bridge Fund. The London event attracted over 100 Alumni from across the business sectors in the city, with many of the attendees being drawn to an alumni for the first time and expressed a keen interest in returning to similar type events in the future. Next up for the TR&I and TDA, is the Trinity Innovation Awards which will take place in Dec 15th at Regent House on the Front Square when we will to celebrate innovation and entrepreneurship at Trinity College Dublin with awards in categories such as ‘inventors’, ‘campus company founders’ and ‘societal impact’. Professor Patrick Prendergast will be on hand to present the prestigious Provost Innovation award and we look forward to inviting our alumni to join with our TCD community in recognising our talented innovators and entrepreneurs who skilfully convert concepts into impact.